As the population ages more Americans will be susceptible to aortic stenosis, but not all patients can tolerate surgery to treat it. 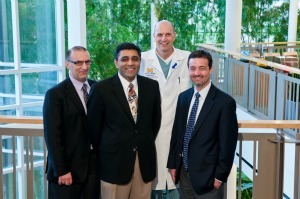 Physicians at the U-M Cardiovascular Center offering patients comprehensive options to treat aortic stenosis include, from left, Drs. Stanley Chetcuti, Himanshu Patel, G. Michael Deeb and Paul Michael Grossman. Patient Michael Baker pictured below. Select U.S. hospitals are now performing minimally invasive procedures called transcatheter aortic valve replacement, or TAVR, to replace a patient’s diseased aortic valve without heart bypass or open heart surgery. University of Michigan Cardiovascular Center surgeons and interventional cardiologists are working together to offer patients comprehensive options to treat aortic stenosis with the new FDA-approved Edwards SAPIEN Heart Valve and through a clinical trial — Medtronic’s CoreValve prosthesis. The U-M, a leader in valve replacement, is the only hospital in the state to offer both transcatheter options for patients who have limited surgical options. Just one month ago, Michael Baker, 53, of Colbert, Mich., would get short of breath while making his bed or tying his shoes. He was among the 1.5 million American adults with aortic stenosis. Aortic stenosis is a condition where the aortic valve narrows, thereby limiting blood flow from the aorta to the rest of the body. Left untreated, aortic valve stenosis can lead to serious heart problems, including heart failure and even death. It’s not uncommon for aortic stenosis patients to experience chest pain, dizziness, and shortness of breath, feel faint with activity, and suffer heart palpitations before treatment. Baker had given up factory work because of his heart condition and passed on other things in life too like waterskiing and fishing for bass and bluegill. Doctors considered him inoperable because of a heart defect and other health problems. But on Jan. 6, doctors at the U-M implanted Baker with the Edwards valve, which was approved by the U.S. Food and Drug Administration in November for the treatment of severe aortic stenosis. “I’m lucky I made it to the end of year. I was getting on the worse side and I wouldn’t have lasted much longer,” says Baker, who is hopeful now following the minimally invasive procedure. The emergence of TAVR procedures in the U.S. is providing new hope for aortic patients with limited surgical options. The procedures allow access to the diseased aortic valve percutaneously, meaning through the skin, usually through an artery in the leg, rather than through open surgery. “It gives us the tools to take care of patients who we were not able to take care of before,” says interventional cardiologist Stanley Chetcuti, M.D., director of the cardiac catherization lab at the U-M Cardiovascular Center. Edwards is the only transcatheter aortic valve replacement therapy approved for use in the U.S., but aortic stenosis patients are also being enrolled in the Medtronic CoreValve U.S. Pivotal trial to investigate an alternative to open heart surgery. Without aortic valve replacement, 50 percent of patients will not survive more than an average of two years after symptoms begin. “Studies such as the PARTNER trial with the Edwards valve have substantiated the benefit of TAVR to extend lives,” says U-M cardiac surgeon Himanshu Patel, M.D., associate professor of surgery. But the goal of aortic valve replacement for these high-risk patients is not only to improve their survival but also to enhance their lives. “For most of these patients, their quality of life is quite impaired because of severe aortic valve disease. They physically cannot do the things that they want to do,” says interventional cardiologist Paul Michael Grossman, M.D., associate professor of internal medicine and director of the cardiac catheterization laboratory at the Veterans Administration Ann Arbor Healthcare System. “We’re very hopeful that this technology will offer them the opportunity to get back some of the quality of life that they probably have lost in the last several years,” he says. The U-M aortic program, part of the nationally ranked heart and heart surgery programs at the U-M Cardiovascular Center, performs over 500 surgical valve procedures a year, which is more than any other Michigan hospital.